Oceanfront one bedroom. Perfect Getaway. low tide and a surf break at mid to high tide. Have your morning coffee on a large deck right over the beach. Gorgeous tidepools, surfing, and kayaking out your door. Whitewater views from every window and door. The kitchen, which contains everything you need for meal preparation, has granite counters and hardwood floors. The apartment is bright and beautifully furnished with wicker, tropical fabrics, shells, and top-of-the-line linens. You will want to come back every year. The duplex is located five minutes from downtown Malibu, close to restaurants, movies, coffee houses, and great shopping. You are only 45 minutes from the Los Angeles airport and one hour from Santa Barbara. Enjoy on-site surfing, swimming, kayaking, boogie boarding, fishing and paddle boarding. 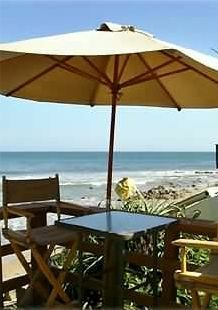 It's important to know that this rental is off of the busy, noisy Pacific Coast Highway and in a private, quiet cove. directly in front of your entrance. We are 30-40 minutes from some wonderful museums - The Getty, L.A. County Museum of Art, and Museum of Contemporary Art. I am a Malibu property owner and a professional artist. My studio and the vacation rental are on the same street. My husband and I have lived in Malibu for 25 years and love sharing this amazing location with visitors from all over the world. I wanted an income source close by and the location is private with a stunning beach. Lower deck has a couch, two matching chairs and a coffee table. Also a bar high dining table with four matching chairs and a gas BBQ. There are wo folding chaise lounges for use on the beach or the deck. This place is a gem - beautiful, laid back and peaceful. Jackie and Stu are kind and warm hosts. We especially loved the terrace right on the beach, the surfers that are right there out the window, and the fabulous kids’ swing. Very special place to relax. Great sunrises, beach walks and views to Catalina. Would have been perfect except for the mouse. Thanks for the 5 stars, Steve, and very happy the fishing was so good! Just like being at home, but on the ocean. I really enjoyed my recent stay at Jackie & Stu’s oceanfront suite. It reminded me of staying at a litttle summer getaway (even in December). Your hosts are fabulous, kind, and wonderful people to inquire about what is near by or the history of the area. And if you enjoy water sports, Stu is very knowledgeable of the surf conditions in the area. I look forward to visiting the Malibu area again soon, and this location will suit my needs every time. Thank you Jackie & Stu!! Thanks for the great review, Jim. Lovely meeting you and hope to see you again soon! Jackie’s apartment is awesome and directly on the ocean. At high tide, waves and water would break directly at the deck. The deck is also awesome for taking a mid afternoon nap (which I did several times). A very relaxing week. Unfortunately, we had to do a little work on-line during our stay - the WIFI was solid - didn’t feel like working. The apartment is fully stocked with soaps, spices, detergent etc. Fully stocked kitchen also - we mostly ordered takeaway from restaurants for dinner - we had the best view in Malibu. Everything was wonderful - hope to return in the future! Paid but did not go. Mother died had to arrange and attend funeral. I learned the hard way that prepaying for a reservation can be a very costly decision. I am grateful the owner allowed me to make some limited use of the property, and wish I had just reserved a room at a hotel where I could cancel the reservation the scheduled arrival day or at worst pay for a single day rather than the entire period. When I asked the owner to allow my sister in-law to use the facility for 3 to 4 days of the 8 I had prepaid for, Jackie immediately agreed saying it sounds like an excellent plan. What Is her name? Please pass along the info I sent you and tell her we’ll be home Friday night. Jackie refunded my security deposit. Another item hotels do not require. She kept the 12% occupancy fee for all 8 days although my sister in law did not occupy the space for all 8 days.